It's common knowledge in the enterprise software landscape that IT managers will often put off much needed system migrations and upgrades out of fear of losing data and disrupting workflows. This is why our software engineers prioritize a pain-free migration experience when moving databases, app code and whole systems to their new home. We provide migration services for enterprise-class applications, servers, operating systems, databases, websites and IT infrastructures, as well as virtual data migrations to mainframes, virtual machines, and digital platforms. Our experts use thorough, risk-averse migration plans for manual and automated data extraction, cleansing, loading, verification, testing, and implementation. Our developers provide website migration services for businesses whose sites currently lack bandwidth, require advanced functionality or are housed by inferior or collapsed webhosts. We use proven backup solutions and perform continuous load testing and performance tuning to ensure a streamlined transition. Our team has experience migrating sites to and from different webhosts (Bluehost, HostGator, GoDaddy) and CMS's (WordPress, Wix, Squarespace). To better consolidate organizations' data and take advantage of big data web services, we perform cloud-to-cloud and on-premises server-to-cloud migrations, moving assets to public, private or hybrid cloud environments. We have experience working with Azure, Amazon Web Services (AWS), IBM Cloud, Oracle, Google Cloud Platform, Alibaba and more. We program custom services for migrating databases to new servers, Database Management Systems (DBMS) and file formats, taking pains to ensure complete data integrity along the way. We migrate multiple data types, as well as business logic schemas, using ETL (extract-transform-load) best practices and robust version control protocols. Our developers perform rapid upgrades for legacy enterprise platforms and migrate all data and business logic to new platforms. 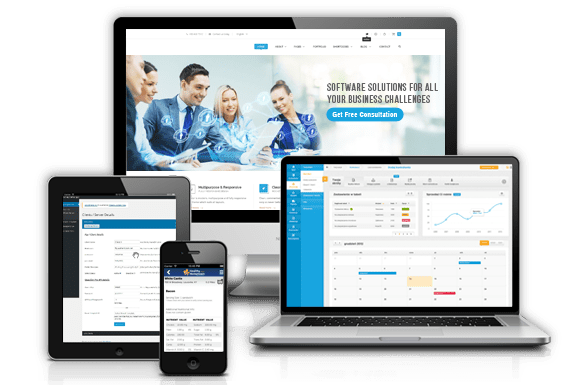 We have experience working with different Enterprise Resource Planning (ERP) platforms, Content Management Systems (CMS), and Customer Relationship Management (CRM) software.